The Puli is a small dog coming from Hungary that was originally used to herd sheep and other livestock. 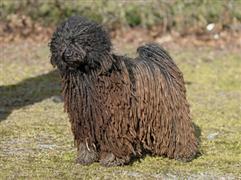 The Puli is best known for its coat that has been described as mop-like and is often compared to dreadlocks. Many owners select names like Rasta or Marley that follow the dreadlock theme. While the breed can vary in colors, most are a solid black. Names that highlight the dark black cords like Cocoa, Hershey, Raven, and Midnight are highly common. The Puli may have a cumbersome looking coat but don’t be fooled, they are deceptively fast. Jet, Pepper, and Dash are some name ideas related to the overall quickness of the breed. Some of our pages will contain a subcategory. A subcategory is a slightly more specific grouping than the main topic of the page. For a subcategory, we will include a separated table of names and corresponding descriptions. An example of a subcategory of Red Dog Names would be 'Dog Names Inspired by Red Wines'. If you have any subcategory ideas for the Puli Names page, we would love to hear them. Use the form below to submit your ideas.